Retrieves a binary text string version of any file but without converting it into Hex or Base 64. The time it takes will depend on the size of the file to be converted and the performance of your computer. You can convert one or more files in a single pass. You can set a custom export. This tool can be useful for script developers. It's main purpose is to embed files into the script code to avoid external resources. Note : This is not for archiving or size reduction. File(s) to convert : Select the file(s) to be converted. You can select several files. Select All : Select all the pages of Result(s). Erase : Erase the selection in Page(s). Page(s) : Page Range. Indicates what has to be exported. By default all the pages are selected so you can just click on the export button after converting the files. Leave blank to export the current page. Enter 2-5 or 5-2 to export pages 2 to 5. You can specify 1,3,12 to export pages 1,3 and 12. Enter -12 to export pages 1 to 12. You can indicate 2-5,10,14,22 to export pages 2 to 5 and pages 10,14 and 22. Folder : Select a destination folder for the converted file(s). Export : Export converted file(s) selected in Page(s). With Page(s) blank, only the current page will be exported. Result(s) : Displays the binary text string for all the converted files. You can navigate between pages, forward, backward, go to the first or to the last page. You can remove all the pages or remove only the current page. 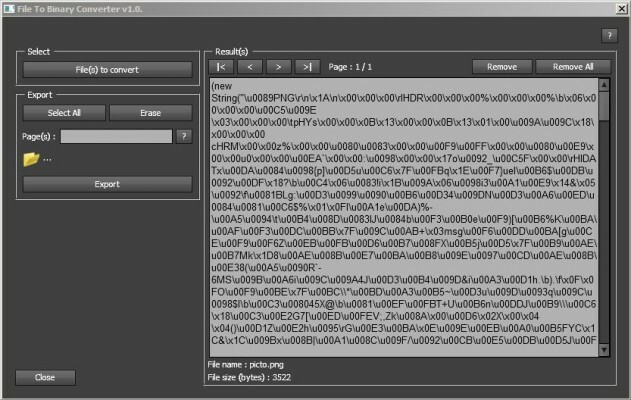 For each converted file, the name and size in bytes are displayed. About : Displays information about the tool. Close : Closes the window. A file size greater than 100 Kbytes is not recommended. It may take a long time to convert, with the risk to crash the program !